Joshua Andrews and Adam Spiegel present Kay Mellor’s FAT FRIENDS - THE MUSICAL, coming to the Alhambra Theatre Bradford from Monday 14 to Saturday 19 May 2018. Tickets on sale to Friends of Bradford Theatres Monday 12 June 2017 and on general sale Monday 19 June 2017. Number one recording artist Sam Bailey, who rose to fame winning the tenth series of The X Factor, will join Jodie Prenger in the original British musical Fat Friends – The Musical. Sam will share the much loved role of Betty, originated on screen by Alison Steadman, with award-winning comedian and actress Elaine C Smith (Two Doors Down, Rab C Nesbitt). Elaine will step into the role during three Scottish dates in Edinburgh, Glasgow and Aberdeen. The award winning TV drama has been adapted for the stage by its creator and one of the UK’s most prolific writers, Kay Mellor, whose extensive television credits include hit series of Band of Gold, The Chase, The Syndicate, In the Club and whose stage credits include A Passionate Woman. The award-winning Jodie Prenger will lead the company in the beloved role of Kelly Stevenson. Sam Bailey shot into the hearts of the nation in 2013, when the former Prison Officer won ITV’s The X Factor and reached Christmas number one with her first single, Skyscraper. She has gone on to receive public acclaim for her role as Mama Morton in the recent UK tour of Chicago. 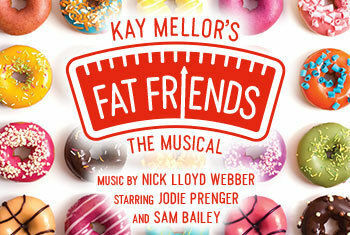 Produced by Joshua Andrews and Adam Spiegel, with original music by Nicholas Lloyd Webber, Fat Friends – The Musical will open at Leeds Grand Theatre in November ahead of an extensive UK tour, arriving in Bradford from Monday 14 to Saturday 19 May 2018. With original music and songs composed by Nicholas Lloyd Webber, designed by Bretta Gerecke, musical supervision, orchestrations and arrangements from Simon Lee, sound design by two time Olivier Award winning Gareth Owen and lighting design from Tony Award nominated Nick Richings, Fat Friends - The Musical, sees the nation’s favourite group of dieters reunited as this new show bursts on to the stage. favourite foodie friends in an original musical bulging with hopes, humour and heart. Join the infamous group of loveable characters as they are put through their Zumba paces at their local branch of Super Slimmers by the lovelorn Lauren whilst Kelly fantasises about fitting into the wedding dress of her dreams. Fat Friends offers a generous serving of hilarious fun with a sprinkle of romance on top!